Did you remember Alathurthali?, the marvelous rock cut temple for Siva in the remote village Malayadipatti. This travelogue is also the continuation of the previous account with another cave temple called Olipathivishnu Graham in the same village. At the end of the village there are cluster of small rocky hillocks and boulders in which these two rock cut caves are found. In the western side of the hillock lies the Olipathivishnugraham facing north. The hillock extends beyond the cave and gradually slopes down in the west. 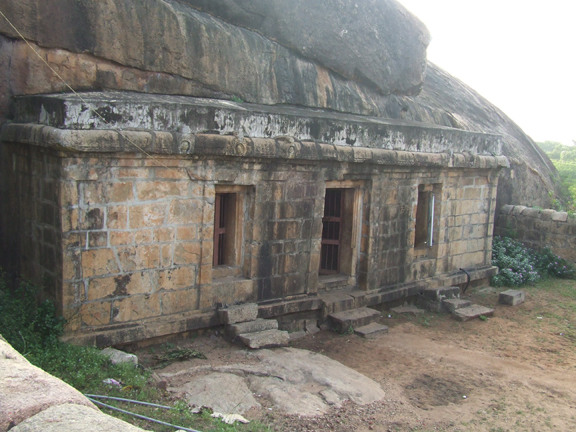 The cave temple has a wall enclosure with a gopura facing north. The temple complex consists of a closed mukhamandapa, ardhamandapa and a sanctum, which constitutes the main cave and two other subshrines near the gopura entrance. The name of the deity is Kanniraintha Perumal and his consort Nachiyar. It is an unusual cave with variety of architectural features and sculptures that are new to me. I always end up with doubts while writing. Naturally this made me to spend more time on Vishnu cave. For this Dr. used to ask "என்ன சுமிதா பெருமாளோட ஐக்கியமாயிட்டியா?". One time I planned of visiting the cave by bus. I didn't even imagined of infrequent transport facility to this site. So I went without any planning of bus timing. It made me to wait in Keeranur for an hour. The roads are the amazing things to note in the village side. In cities we can spot pot-holes, but here are the craters on the road, and no wonder the commutation on these roads are awful. When I was at the extend of losing my patience, the most awaited Bus arrived. Oops! The Bus is another dreadful thing with all its parts hanging in half screw. I had a roller costar experience in my travel. I even got a stomachache, which only relieved after returning home. When will this people get atleast basic amenities? Will Kanniraintha Perumal open his eyes for them? Coming to my topic, the gopura has a flat roof with padabanda adhisthana and the wall is adorned with brahmakanta pilasters, four on each side. The pada in the kanda portion is occupied with miniatures like elephant, bird and scrolls. The pilasters possess the usual upper parts. The hands of angular potika spread on both sides above the pilasters and hold the uttira. A thin vajana and valabhi with bhutavari are the other roof features. The kapota is flexed and overhanging with four kuduarches on each side. Above the kapota is shown the bhumidesa with yazhi vari and projected makaras at four corners. On both sides of the gopura, wall enclosure extends and ends adjoining the mother rock in the south. The eastern wall separates the two caves as individual temple complexes. The floor level of the Siva temple complex is upto the height of the eastern compound wall. 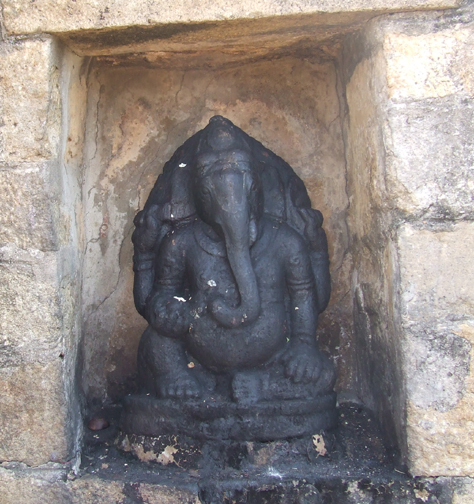 In the outer side to the left of the gopura entrance is a Ganesa idol placed inside a niche facing north. The valamburi Ganesa in karandamakuta and ornaments is seated on a padmapita in maharajalilasana. The right back hand is holding the broken tusk and the left hand is holding angusa. The front right hand is holding a motaka rests on the knee and the left hand is on the thigh. As one enters the temple complex, to the north west is seen a structural shrine for Goddess Nachiar facing east. The structural shrine consists of a small mukha mandapa and a sanctum of same size. A space is left between the compound wall and the shrine in north and west as perambulation for this shrine. An inscription of Subhagiri year, Aippasi 10th, found on the sidewall records the construction of this shrine to Nachiar and consecretion of the Goddess by one Araiyan, named Manganthenkondan S/o. Sellapokkan of Thenmavur. The goddess seated in arthapadmasana is decorated with karandamakuta and ornaments. The back hands are holding lotus flowers and the front hands are in abhaya and vara. On the north east corner is a small structural construction extending towards south with entrance in the west. The northern and eastern wall of the fence forms the hind and sidewall of the mandapa. The rear part of the mandapa is the kitchen which is partitioned by a wall with entrance in the middle and in the front part four sculptures are kept facing west. Among the four sculptures three are Azhwars and the last one is Vishvaksena. The first sculpture is Thirumangai Azhwar standing in sama on a pedestal holding a sword in right hand and shield in left hand. Next to Thirumangai Azhwar is Udaiyavar Peruman, seated in ardhapadmasana on a pedestal with hands together in anjali hasta. Next is an unidentified saint, sitting in same posture with right hand in abhaya and left hand on the left leg. Both are wearing ornaments made of beads. 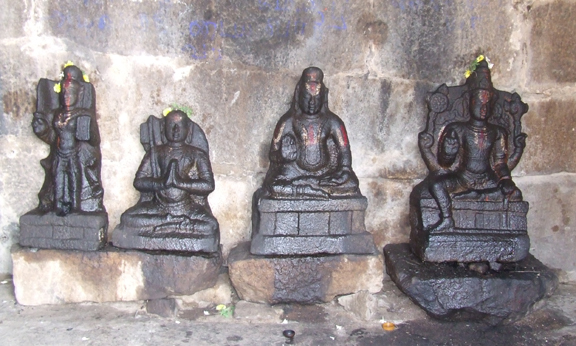 The fourth sculpture is vishvaksena seated in suhasana with back hands holding sangu and chakra and the front right hand is in darjani mudra and the left hand is holding gadha. In front of the rockcut cave and in the centre of the temple complex is seen the lamp post and balipitha in the middle and on either side is the sculptures of Goddess and Garuda. To the north of the lamp post is a Goddess seated in ardhapadmasana facing the gopura. The front hands are in abhaya and vara whereas the back hands are holding lotus. Next to the Goddess is the stone lamp post with square base and Vishnukanta shaft. The base has miniature sculptures on all the four faces. Sangu and chakra occupies the east west faces and Garuda and Hanuman occupies the north south faces. To the south of the lamp post is Garuda seated in ardhapadmasana with feathers stretched on sides. karandamakuta adorns the head and patrakundalas, charapali, bangles and armlets are the ornaments found. The hands are in anjali hasta facing towards the shrine. In between the Garuda and lamp post is the circular balipitha. The cave consists of a sanctum and a mukha mandapa with three door entrances in the anterior are cut out of the mother rock, and a structural addition adjoining the door entrances in the front. The structural mandapa has a basement with the features of upana, kanda, vajana and upari kampu. The upana is visible only on the western end, whereas in the remaining places it is inhumed in the soil. Above the basement rises the wall with six Brahmakanta pilasters. The potikas are seen only above three pilasters, on the pilasters at either end and above the pilaster to the right of the entrance. The angular potikas hold the uttira and vajana. The kapota is flexed and overhanging with kuduarches and ghandarva heads inside the nasika. The entire structure is in uneven level, comparing to the eastern side the western side is skewed. The entrance to the rock cut shrine is in the middle of the structural addition with windows on either side. A flight of three steps in the centre leads us to the mukhamandapa. The faவூade with three door entrances cut out of the mother rock and the structural addition in obverse forms a mandapa like structure running east west direction. 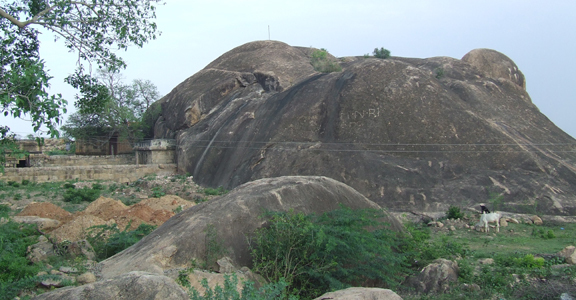 The mother rock and the structural addition approximately constitute 2.5 mts total width in north south direction. The length of the mandapa in east west direction is 9.65 mts. The mandapa on both sides and on the roof adjoins the mother rock. The roof of the structural addition is covered with stone slabs resting on the kapota in the front approximately to a height of 1 ft. 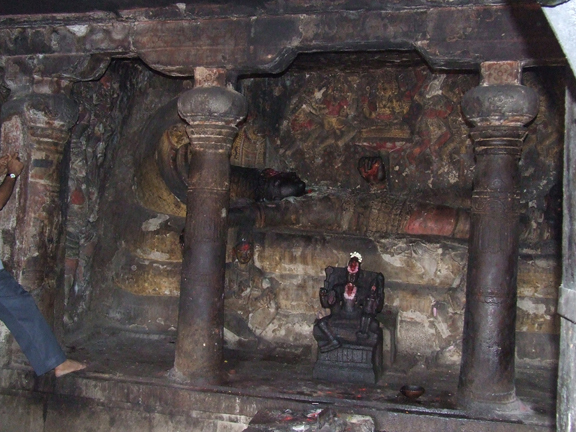 The original cave consists of a sanctum and a mukhamandapa. The anterior wall of the mukhamandapa is parted in the middle as three door entrances and the remaining portion on either side, niches are formed in the recess to house Dvarapalas. Unlike the other caves the three sections are formed as three door entrances. The left over wall portions in between the sections are decorated as doorframes with embossed pilaster in the jambs. Thus there are four split pilasters, two in the middle and each one on either end in the east and west respectively. The pilasters give the facade look to the entrances. The faவூade with door entrances measures 7.03mts in north south direction. 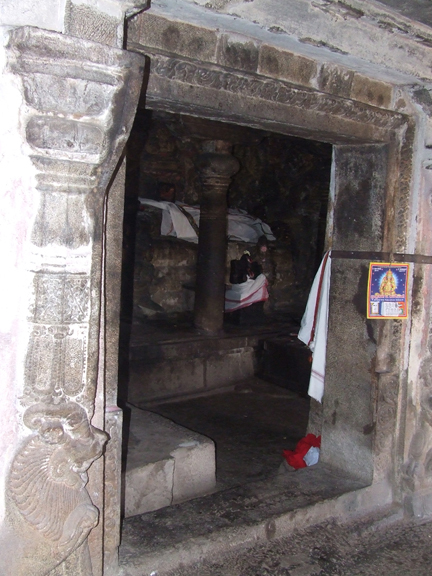 According to Dr. R.Kalailovan this sort of portrayal of door entrances in the facade is something unique, which one haven't come across in any other cave temple in Tamilnadu. The three sections though looks similar varies in measures. The eastern section is 1.59mts and the middle and the western sections are 1.68 mts. The width of the sill is .39mt and the height varies from 10 to 20 cms. The pilasters are short and massive with animal base bearing the Vishnukanta shaft. On either sides of the middle section, pilasters raise on a squatted lion. Both the lions are seated in profile on a padma pedestal with their front outer limb raised and their face twisted towards the entrance. Whereas the pilasters on either ends raise above the squatted yazhis which are also shown in profile position with their raised front outer limb. The rectangular pedestals under the lions are well formed padma, whereas for the yazhis the base on either side is unfinished and extends as a common base for the doorkeepers also. The lions of the middle pilasters and the yazhi of western pilaster are squatting towards east whereas the yazhi in the eastern pilaster is facing west. All are shown with wide opened eyes erupt ears, sharp nails, tear teeth and thick manes. Different styles are handled in the manes, the yazhis' tresses are straight whereas of the lions' are with curled ends. The Vishnukanta shaft is decorated as mala, stana, kattu, kalasam, tadi, kudam, pali, palaka and veerakanda. The stana is given a crisscross marking with ornamental decorations inside it and holds the hanging beads mala. The kattu is padma in style with lotus petals on either side. These ornamental works give a rich look to the pilasters. The arms of angular potika extend upwards on both sides holding the uttira. The potikas are decorated as taranga with kulavu in the middle and medianpatta. The kulavu is seen only in the eastern pillar and pilaster whereas the taranga itself is absent in the western pilaster. Above the potika the projected vajana runs throughout the roof and extends in the west kapota. The canopy of the kapota is flat. The door frames possess jambs, sill and lintel. On the three door entrances, the door jambs, lintel are engraved with ornamental works. The door frame is shown in two variations. It has a base to an approximate height of .60 mts and above that split into two as projected inner and plain outer frame. The scroll carvings start at the outer face of the base and extend on both sides on the projected portion and continued on the lintel also. Above the upper frame kanda with pada feature is shown. The padas are decorated with scrolls of swan and in the corners miniatures of yazhi and lion are seen. On either side beyond the facade the mother rock extends upto a length of 1.27mts in the west and 1.35mts in the east. Beyond the corner split pilasters Dvarapalakas are housed in the recess one on each side. The whole cave temple from the facade to the sanctum including the presiding deity is embellished with stucco and painting decoration. It gives a clumsy and ungraceful appearance to the entire structure. Both the basrelief dvarapalakas are facing straight with their inner leg in parsva and outer leg in tryasra. Both are wearing short dress with the idaikattu holding it on the waist and heavy knots floating on sides. The locks are arranged as Jatamakuta and decorated with forehead ornaments. Charapali, patrakundalas, bangles, armlets, baguvalayam and udarabanda are the ornaments found. The armlets are with simha faces. Yajnopavita is thick and very ornate with flower designs in the middle and the dvarapalaka in the west is wearing it in niveta style. Their inner hand is holding lotus flower and their outer hand is in katyavalambita. A hooded snake is seen above the shoulders of both the dvarapalakas. For the eastern dvarapalaka it is coiling around his right arm and raising its hood above the shoulder. The usual depiction of dvarapala as a daunting door keeper is absent here, instead the dvarapalas of Malayadipatti are well built with slim frame and having a graceful face with light smile, thin eyebrows, wide eyes looking sideways. The momentary look adds grace to their face. 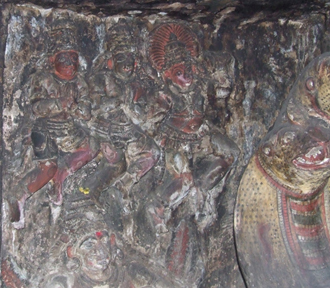 The dvarapalas are the only sculptures in this cave temple where the stucco covering is removed. The space between the facade door entrances and the sanctum constitutes the mukhamandapa. On the southern wall of the mandapa the sanctum is cut in the middle and on the remaining spaces on either side, niches are formed to house Vishnu in other incarnations. 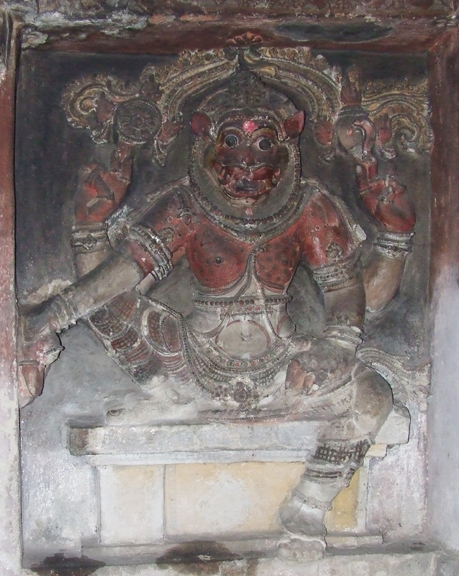 Narasimha houses the western niche and Hayagriva, the eastern niche. The lateral walls of the mandapa houses Vishnu with his consorts. On either end, the floor of the mukhamandapa is having a raised platform adjoining the southern wall and a space is left out between the facade and the platform. Throughout the mandapa uttira and vajana are shown. The uttira and vajana are having paintings of flowers. 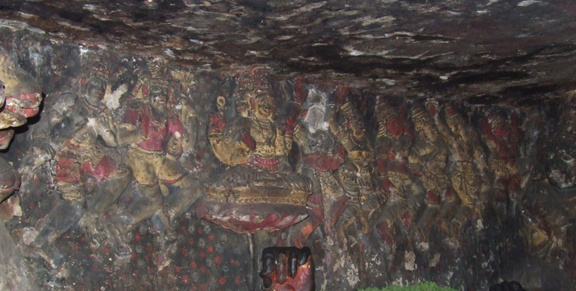 The canopy of the mukhamandapa is fully covered with paintings. The ten incarnations of Lord Vishnu is depicted in the roof painting. The pictures at both ends are clear, while in the middle the painting is expunged by smoke and dirt. On the eastern end is Hayagriva and dancing Krishna. Next to Krishna are Balram and Ram. The next four figures are unidentified as they are not clear. 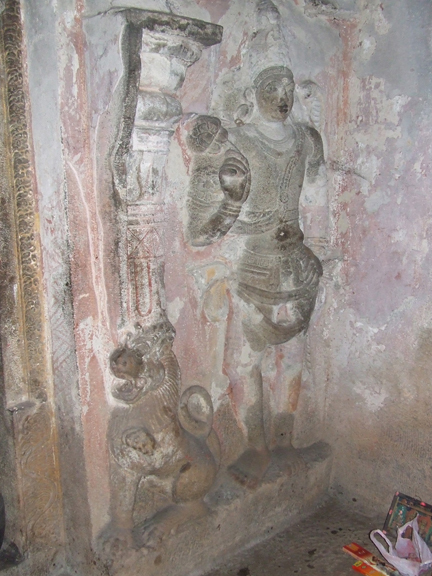 Last two figures in the west depict Narasimha and Macha avatar. Two layers of painting are noticed in the centre of the ceiling. 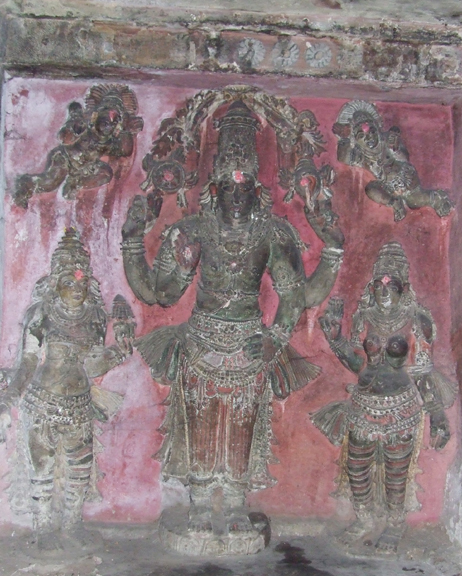 Vishnu with his consorts occupies the whole of eastern lateral wall as a bas relief panel sculptures. The whole panel is covered with stucco and paintings. All the three deities are standing in a pedestal cut out of mother rock. Vishnu is standing in sama on a padma pedestal, with back hands holding sangu and chakra, and the front right hand in abhaya and the front left hand on the hip. 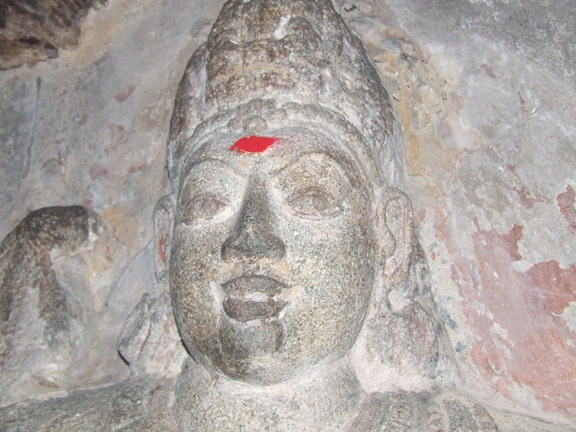 Tiruvasi is shown above his head. To the right of the god is Sridevi standing in tryasra with her right hand stretching on her side and left hand holding lotus. Likewise Bhudevi is standing in tryasra with her left hand stretching on her side and right hand holding a flower. She is shown without breast band. On either side of Vishnu near his head one on each side is flying figures of Surya and Chandra holding flower in their outer hand and eulogizing the God with their inner hand. On the western lateral wall of the mandapa, Vishnu with his consorts in seated posture is seen. In our first sight it gives a look of a basrelief panel cut on the lateral wall. But it is made out of three separate pieces of sculptures, evenly cut and minutely joined to form a single panel on the wall. All the three deities are seated in the pedestal, which has a padabanda adhisthana and placed their leg on projected lotus pedestal. Vishnu seated in suhasana with his hanging right leg placed on the padma pedestal and holding sangu and chakra on his back hands. His front right hand is in abhaya and the left hand is on the thigh. Both his consorts are seated in utkudiasana with their stretched leg rested on padma pedestal. Their inner hand holds a flower bud, whereas their outer hand rest on the seat. 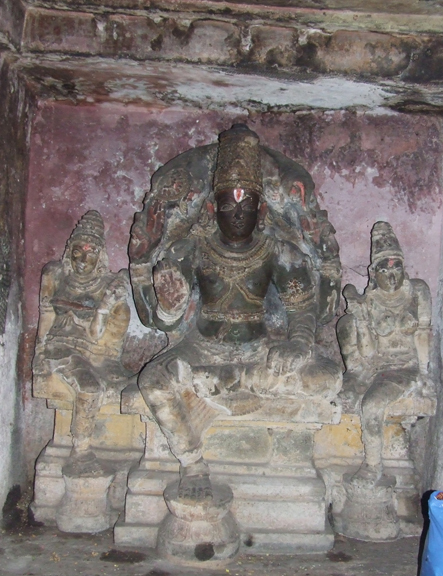 Thiruvasi is shown behind Vishnu. In the southern wall of the mandapa, the sanctum is cut in the middle and on the remaining spaces on east and west niches are formed to house Hayagriva and Narasimha. Hayagriva occupies the eastern niche and Narasimha, the west. On either end adjacent to these niches paintings are seen. 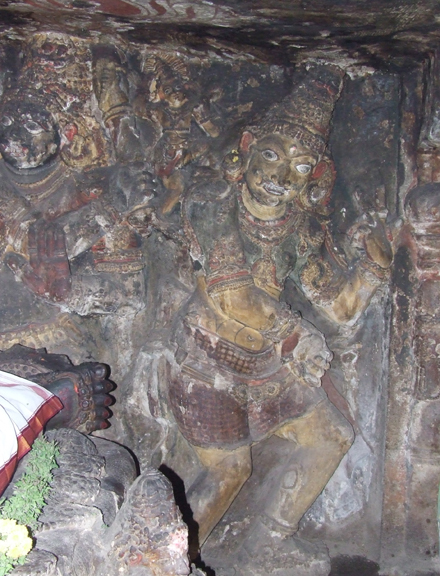 To the left of Narasimha, an obliterate female painting is seen for which only the trunk is visible. The painting is shown with only the lower garment, which is in chequered pattern and without any covering around the breast. She is wearing ornaments and a garland around the neck. A sword is shown on her waist. On the eastern end adjacent to Hayagriva, Hanuman is seen in anjali hasta and bell on his tail. He is wearing a lower garment of chequered pattern and garland around his neck. In the southern wall, beyond the western pilaster a niche to the height of 1.72 mts and width 1.43 mts is formed to house Narasimha. The deity is seated in utkudiasana on a pedestal with his left leg resting on the niche floor, backhands holding sangu and chakra whereas the front left hand is on the thigh and right hand is stretched above the right knee. Beyond the eastern pilaster a niche to a height of 1.97 and width 1.47 is formed to house the basrelief sculpture of Hayagriva. Hayagriva is seated in suhasana on a platform. The platform is shown with upana, kanda flanked by kambu and vajana, which can be considered as an upapitha. In the upana a circular padma is cut as a foot rest for the deity. The back hands hold sangu and chakra whereas, the front right hand is in abhaya and left hand is on the thigh. Kritamakuta adorns his head. Unlike the other sculptures, for Hayagriva thiruvasi is shown extending on either side raising on a rampant yazhi. In the centre of the southern wall sanctum is cut to the height of .52mts from mandapa floor level. The raised portion has the features of upana, kanda with pada flanked by kambu on both side and vajana. The upana of the basement extends as a moon stone in the centre of the mukha mandapa floor. The facade is 4.30 mts in east west and .36 mts in north south. The upper surface of the vajana extends as the floor of the sanctum. The facade, which is little higher to the sanctum floor level, has two pillars in the middle and two pilasters each one on either side. The pillars and pilasters are rudra with padma base. 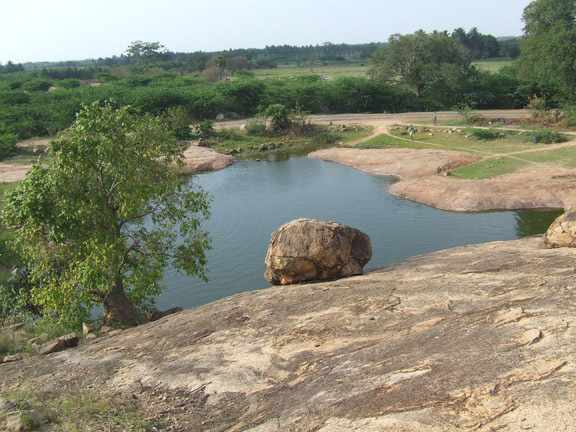 The upper features are idaikattu, mala, stana, padmakattu, kalasam, tadi, kudam and veerakandam. 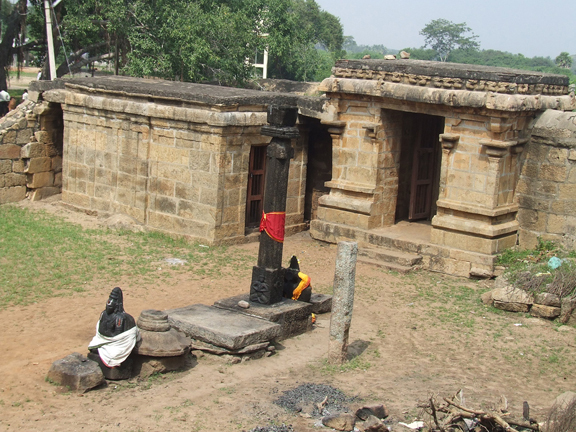 In the eastern pillar, the padmakattu is shown on either side of stana whereas for the western pillar the kattu is provided only above the stana. Tadi is decorated as urthava padma. The split pilasters in the corners have the same features. Above the pillars and the pilasters potika of angular type holds the uttira and vajana. The pillars and pilasters and the roof portion of the facade covered with stucco and paintings. In the centre of the sanctum a later sculpture of Lakshminarayana is seen in suhasana on a platform with backhands holding sangu and chakra and the front right hand in abhaya and front left hand holding the goddess Lakshmi seated on his lap. Both the deities are wearing silk dress upto their ankle. Karandamakuta adorns their head and makarakundalas their ears. Lakshmi with flower in the left hand hugs the God with the right hand. The sanctum of this rock cut temple is different from that of the usual pattern of cubical room. The convex shaped sanctum is housing Lord Vishnu reclining on a snake, occupying the whole of the sanctum. The bow shaped wall is fully depicted with bas relief panel. The five hooded Adhisesha afford its body as bed and hood as awning for the God. The body of the snake twirled thrice to form a couch to the deity. Vishnu resting his head on a pillow in the east is facing the roof. The left hand is raised near his hip and shown in kataka mudra whereas his right hand resting on the bed is stretched upwards to descend at the wrist. Krita makuta adorns his head and various ornaments are shown in stucco features. His legs resting on a pillow is touching a lotus flower in the west for which a stalk is shown raising from the floor of the sanctum. Decked with variety of ornaments Vishnu with his broad face, wide opened eyes, sharp nose, dimple chin looks very elegant and graceful. In front of the couch near the right hand of Vishnu is Markandeya and near his leg is Bhudevi. Both the sculptures are cut out of the mother rock are sitting in garudasana facing each other. Markandeya in jatamakuta is showing chin mudra with his right hand and holds a bud in left hand. Boodevi in kritamakuta is in anjali hasta. The bas relief sculptures of the sanctum are cut approximately to a height of 1 inch from the sanctum floor level. The whole panel including the twirled body of Adhisesha is on this raised portion, which is shown with variation as a projected demarcated floor from the sanctum ground level. It starts adjoining the eastern pilaster and extends for Markandeya in square shape and in the centre of the sanctum raised to a height of .27 mt as a pitha and again lowered for Bhudevi in square shape and reaches the western wall of the sanctum and serves as the raised floor for the western wall sculptures and ends adjoining the western pilaster. In the eastern wall of the sanctum the basrelief panel starts with Garuda in the lower level and three other flying figures in the upper level. The first two flying sculptures in the upper echelon are with their hands in anjali hasta. Both in short dress, krita makuta and rich ornaments shows their position as Devas. Next to them is Chandra with halo behind his head and nilothbava bud in his right hand. The Garuda in the lower stratum is with stretched wings, hands and legs in flying posture. He is shown with short dress, karantamakuta and ornaments. 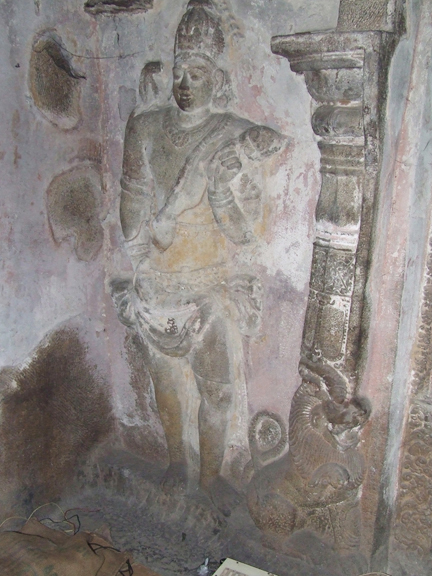 The southern wall of the sanctum is full of bas relief sculptures. 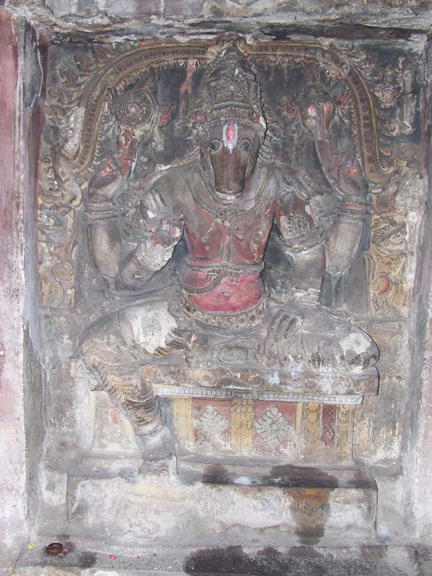 In the centre of the wall above the reclining Vishnu is Brahma sitting on a lotus. Apart from Brahma there are eight ghandarvas in flying postures, to the left of God is six and to right of him is two figures. Except Brahma, all are artists of music and dance entertaining the presiding deity in flying posture. Brahma in ardhapadmasana is seated on the lotus. Brahma in makuta and ornaments is holding akshamala and lotus in his back hands and the front right hand in abhaya and left hand rests on the thigh. To the right of Brahma is a sculpture with short dress, jatamakuta, mustache and beard picturize him a Sage. The sage is holding a musical instrument in his left hand and the right hand is in kodi mudra. A peculiar feature to note in this sculpture is, the Sage is holding the instrument in weird position. Usually instruments are embraced in the left hand resting on the lap and shoulder in a cozy posture to play. But here the sage is holding the instrument with his left hand and resting the pot like bottom on his thigh but the stalk is shown behind his arms. It is puzzling whether this absurd position has occurred due to the stucco covering or the sculpture is carved in this way itself. Next to the sage on the eastern end is another flying figure holding a string instrument in his hands is with short dress, karanda makuta and ornaments. Both the instrumentalists are part of the convoy, to the left of Brahma, who were performing dancing treat to the God. To the left of Brahma is Six flying figures. Immediate to Brahma in the left is the goat faced Thakkan. Thakkan is wearing a short dress and his right hand is raised upwards in kodi mudra adoring the deity and the left hand is in kataka mudra. The remaining five figures are in dancing posture. Next to Thakkan is two female figures in dancing posture. Both are dressed upto their ankle, karandamakuta and variety of ornaments are found. The first lady is dancing with smile, with her left hand on her hip and right hand raised upwards and eulogizing the God. The second dancing lady is showing the left hand in vismaya and leaving the right hand to her side. Next to the female dancers are two male dancers. Both are with karandamakuta, short dress and ornaments. The first male dancer's right hand is holding the left hand which is showing Vezha mudra. The second male dancer is holding flower in his left hand and the right hand is raised in tripataka mudra. The last sculpture is a dwarf, dressed in short dress and rudraksha ornaments is dancing with its two hands raised upwards. Vishnu in reclining posture is enjoying the recital. The smiling faces of the artists reveals that they are performing their concert in joy and ecstasy for the enchanting deity. The whole of the western wall is occupied by two giant sized demons called Madhu and Kaitabha. The first demon is near the feet of Vishnu, which is touching the lotus. His legs are jam-packed in a tiny space between the western wall and snake twirl. Another demon is shown in portrait size. Both are wearing short dress and heavy ornaments. Heavy makuta with simha faces in the center adorn their head. Snake kundalas decks their ears, but the first demon on his right ear is wearing makara kundala. The right hand of the first demon is holding a club near the left shoulder and the left hand is showing stop in kodi mudra to the God as if he is frightened at the stare. The left hand of the second demon is in vismaya and the right hand is twisted and holding a round object. Apart from the canine teeth, spew-out eyes of these ogres, they are more daunting in the stucco and painting envelope. In between the two demons near the head of the first demon a small sculpture of Surya is seen with his left hand holding a flower and the right hand in adoration. The whole cave is embossed with stucco and paintings, which once may have given an embellishing look, but now it lost its prodigy. The stucco embossing due to passage of time lost its colour and grace, gives a gawky look to the cave, particularly the sanctum. It hampers in discerning the sculptures in its original form. The lamp stand fixed in the middle entrance spoils the beauty and the burning of the lamps gives a smoke covering to the painting in the ceiling. Thus a millennium old monument is concealed in stucco and grime.